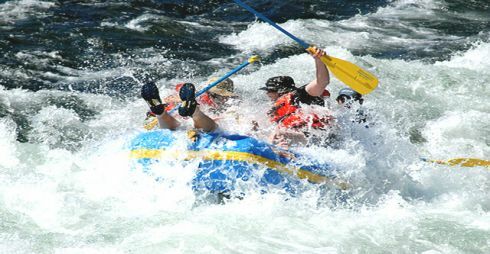 There are different location of River rafting in India like Uttarakhand, Jammu and Kashmir, Himachal Pradesh, Sikkim, West Bengal & Arunachal Pradesh. Principally organised in Indus River, Ganges River, Tista river, Alaknanda River, Bhagirathi river, Kali Sarda river, Brahmaputra River and Beas river of Himachal Pradesh in Manali. In Ladakh the main stretch is between Spituk to Saspol. In Himachal Pradesh state the rivers which offer this opportunities are the rivers Chandrabhaga (Chenab) in Lahaul, the Satluj near Shimla, the Ravi near Chamba and the Beas near Kullu. In Sikkim its one of the latest entrants which the best stretches are Teesta and rangit rivers. There are stretches in Arunachal Pradessh in the river Kameng & river Brahmaputra in Arunachal & Assam. Pick up from the New Delhi Airport/Railway station and drive to Rishikesh. Upon arrival traditional welcome check in hotel & overnight. After breakfast, go for Jungle Trek to the Neerghar waterfall( trekking 4 Kms both side on Hill) Enjoy stream bath and then transfer to camp. Have lunch. Also enjoy evening bonfire with light snacks. Have dinner. Overnight at the camp. Drive to Marine after breakfast. Start Rafting from Marine Drive to Shivpuri for 8Kms. Hit some of the most exciting rapids on the Ganga. Get back to camp for lunch. Post lunch, reach Shivpuri Rock Climbing site and try your hand at Rock Climbing and Rappelling. Return to the camp. Lots of activities like beach volleyball, Kayaking, Rock Climbing, tug of war, Body Surfing. Enjoy evening snacks and Bonfire Dinner. Overnight at the camp. After breakfast in the morning, leave for Haridwar. Enjoy a full day tour visit to Neelkanth temple, Mansa Devi Temle & evening Har Ki Pauri Ganga Aarti. In the evening, get back to camp. Have dinner. Overnight at the camp. Leave the camp after breakfast in the morning. Start River Rafting from Shivpuri to Ramjhula Rishikesh for 16 Kms. This day we will hit some of the most exciting rapids on the Ganga i.e. Return to Sender, Roller Coaster, Golf Course & Club house. We hit Initiation, Double Trouble, and Hilton. One can also try Body Surfing and Cliff Jumping in this section. In the later part, we float past temples and ashrams and Ghats. Enjoy the riverbank life along the Ganga. Arrive in Rishikesh overnight at Hotel. After breakfast depart to New Delhi for onward destination.